Although quite a few of his best-known recordings were done in Philadelphia under the supervision of popular R&B DJ Jimmy Bishop, Winfield Parker was a product of the state of Maryland where he received his early musical training. The veteran soul vocalist has concentrated to a sizable extent on gospel music since the mid-80s, which makes his secular performance at this year’s Ponderosa Stomp particularly special. During this time Parker dabbled on guitar and even joined a doo-wop group called the Tall Cedars, but the instrument didn’t capture his attention for long. One of his cousins hipped him to the joys of the saxophone and by age 14 he was seriously getting into his horn. Parker wailed on tenor sax while his cousin, Herbert Holland, handled guitar duties. The combo gigged locally until Parker dropped out of high school midway through his junior year. The Veejays wouldn’t exist much longer after that, but Parker’s career was just getting started. Singer Sammy Fitzhugh and his band, the Moroccans, had made their vinyl debut on the Poplar label in 1959 with the rocking double-sider “Sadie Mae” b/w “Linda Baby,” and they subsequently found themselves one sax player short. Parker made his first foray into a recording studio while in the employ of Fitzhugh, playing saxophone on Sammy’s 1960 Atco single coupling “I Feel Allright” and “Lover’s Plea” before he moved on. 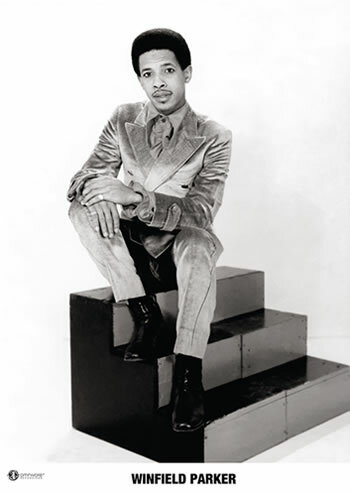 Parker’s next notable hookup came when he crossed paths with rock and roll pioneer Little Richard. Richard needed an additional saxophonist as well, so Parker soon hit the road again with the Wildman rocker. Home was where promoter John V. Bishop was. Bishop booked bands that Parker had been a part of at some of the nightspots where he promoted the entertainment. He also worked closely with the powerful Rufus E. Mitchell, a regional groundbreaker when it came to working with African-American musicians. Mitchell formed a dry cleaning shop in Baltimore in 1956 and doubled as the general manager of Carr’s Beach, a famous African-American summer resort near Annapolis that housed an amusement park and featured plenty of top-flight live entertainment to bring folks into his facilities. Mitchell had partnered with Jack Brown in 1963 to form the Ru-Jac label, but they’d only issued a handful of singles by Jessie Crawford and Little Sonny Daye prior to discovering Parker. The Imperial Thrillers wouldn’t be invited to the session to play behind their boss. The Shyndells, a band led by bassist James Gilyard that was already part of the Ru-Jac stable, was recruited to back the young singer on the soulful ballad “My Love for You” and its flip, the self-penned soul rocker “One of These Mornings.” The 1964 single billed him as Little Winfield Parker (the “Little” would be dropped on future releases). Operating from 427 Laurens Street in Baltimore, Ru-Jac quickly adopted Parker as its flagship artist, releasing nine singles that stretched into 1968. The raucous “Rockin’ In The Barnyard,” was Parker’s encore outing, flipped with the heartfelt ballad “When I’m Alone.” His next Ru-Jac offering coupled two grinding stomps, “I Love You Just the Same” and “My Love.” The Shyndells provided punchy horn-fueled backing arranged by Paul Johns. Mitchell split authorship on “My Love” with composer Wesley Aydlett. A still-unknown Arthur Conley supplied the plug side of Parker’s fourth Ru-Jac single, the hard-driving “Go Away Playgirl,” which sounds like a lost hit with its tight bank of horns and organ cushion pushing Parker to scintillating heights. “He was singing with a band up in Aberdeen, somewhere up there,” says Parker (Conley cut the original version of “I’m A Lonely Stranger” with saxophonist Harold Holt’s band for Ru-Jac before redoing it the next year for Otis Redding’s Jotis logo). Parker’s own sumptuous ballad “Wondering” sat on the B-side. Arthur was also responsible for both sides of Parker’s next Shydells-backed Ru-Jac single, twinning the relentless “Sweet Little Girl” and a soul-soaked ballad, “What Do You Say?” The single impressed the powers-that-be at Atco Records enough to pick it up for national consumption. So Parker stuck with Ru-Jac, issuing two originals, the devastating rocker “She’s So Pretty” and a gorgeous downbeat “Oh My Love,” back-to-back in 1967. “I wrote a lot of my stuff on Ru-Jac,” he notes. They were recorded in Philadelphia at Frank Virtue’s studios rather than in Baltimore or Washington, D.C., as had been the custom for Parker (Johns returned as arranger). A remake of “I Love You Just the Same” soon followed, with the heartrending “A Fallen Star” — penned by its arranger, Jimmy Dotson — nestled on the flip (both hailed from the Philly date). It was only a one-time visit to the City of Brotherly Love, but it laid the groundwork for Parker’s recording future. In 1985, Parker decided to travel a different musical path, wholeheartedly embracing gospel music. “When the disco came out, it was knocking us out of work,” he says. “And I got into a little trouble. I said, ‘Well, I’ve got t o turn this thing around.’” He made several CDs of spirituals for the BP label and Sending Up My Timber with his group, Praise, for Philly’s Guyden Records in 2003 (the same company that had distributed Arctic more than three decades earlier). Parker’s long and winding career has taken him all over the planet. “I’ve been to London, Wales, Amsterdam, Holland, Skegness,” he says. Before long, he’ll be able to add New Orleans and the Ponderosa Stomp to that lengthy list of prime destinations. LaLa BrooksLeslie Goreronnie spectorShe's Got the Power!